Banking and Finance course PGDBF. Course duration is 1 year in that 9 months classes will be held @ MGES campuses and 3 months training will be given at IDBI branches. IDBI recently joined with the MGES for implementing their staff strength with good banking skills. Successfully training completed candidates will be posted in any one of the IDBI branch as a Assistant Manager. Total available vacancies of Assistant Manager Positions in IDBI bank are 500. IDBI Bank will recruit the candidates through online test only which is going to conducted on 17-05-2019. Interested candidates can apply online on or before 15-04-2019. For more details regarding IDBI Asst Manager Jobs exam syllabus, exam pattern, age limits and more information is given below. Total available Assistant Manager vacancies are 500. PWD: VH (5 posts), OH-05, HH-05. Candidate must have completed graduation from a recognized university. Lower & Upper Age limit as on 01 March 2019 is between 21 years- 28 years. Age relaxation applicable as per Government rules. Assistant Managers in Grade A in the pay scale of ` 14400-40900. Application fee for SC/ST /PWD category candidates: Rs. 150/-. For all other category candidates: Rs. 700/- (Application fee + Intimation Charges). Selection for this Assistant Manager Course in MGSE will be based on online written test only. Successfully training completed candidates only appointed as Assistant Managers in IDBI bank. Eligible candidate can apply online through the official website of www.idbi.com. Select Careers and click on the link of Online Applications for Manipal School of Banking and Finance. A new window will be open and click on the new registration complete all the process. 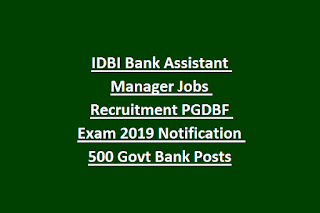 Click here to apply online for Asst Manager Posts of IDBI bank. 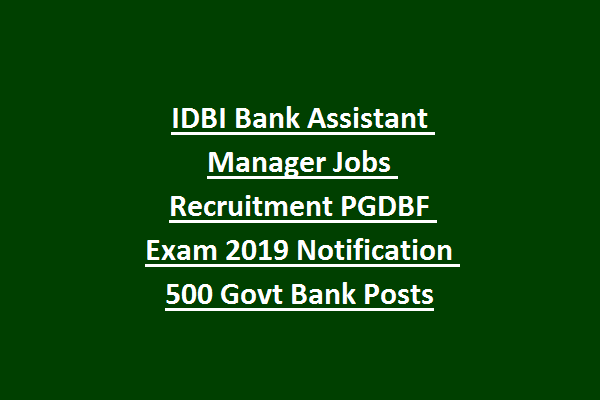 Download official notification here for Assistant Manager Jobs of IDBI.